An ever growing 18 people turned up this week. We might even make the dizzying heights of the first ever IpBoG sometime soon and have 20 attendees. What we did to drive people away that first week I'll never know! This week we split into four groups playing Tzolk'in: The Mayan Calendar, The Manhattan Project, Bang! and Elder Sign. For me it was a toss up between Tzolk'in and The Manhattan Project, both games I'd wanted to play for a while. In the end I opted for The Manhattan Project with Steve and Dan. It was our first time playing for all of us unless you count Steve's solo run through to learn the rule. I kind of do because he slightly knew what he was doing whereas Dan and I were just playing with uranium like Duran Duran was still in fashion. The first half of the game went badly for me, I didn't get the right combinations of buildings early on and no new buildings were coming in. I did my usual worker placement analysis paralysis of not knowing what to do because all choices looked equally bad to me. Steve was racking up yellowcake and Dan was racking up airstrikes. Not considering me a threat, Dan concentrated hard on bombing Steve while Steve furiously tried to construct replacement buildings. This brought in new buildings for me and I managed to get an engine going at last. It came down to what looked like the last round or two where either Steve or Dan were going to win. Just to be on the safe side Dan called in an air strike and bombed my uranium enrichment plants. It came to my turn and I used the espionage track for the first time in the game, allowing me to send a worker onto another player's building. I sent him onto Steve's uranium enrichment plant giving me enough uranium to build two bombs in a single turn winning the game, although perhaps a little underhandedly. It was my poor playing at the start that made me seem like so little of a threat and I'd by lying if I said that was my plan all along but a win's a win never the less. 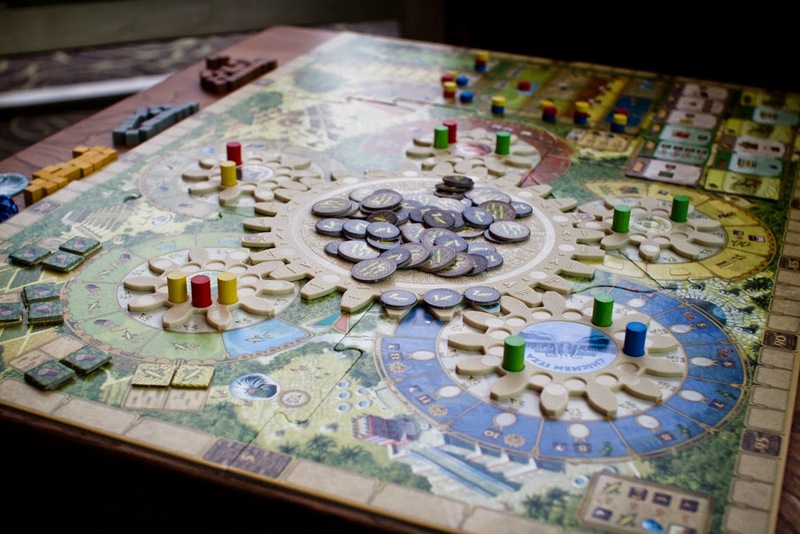 Andy had brought in Tzolk'in, a highly rated Euro with spinning wheels. I don't know much else about it except that it was a close game with Andy being beaten to first place by a single point. 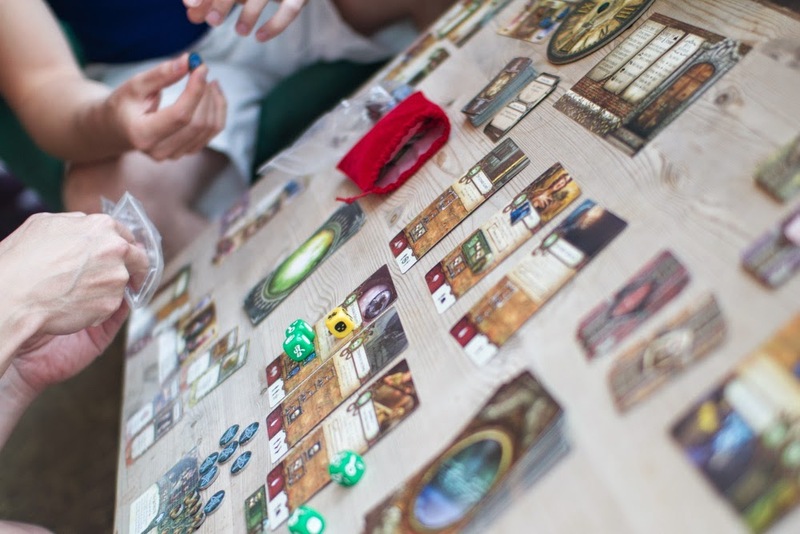 Newcomer Will played using his expert dice rolling skills to lead his team to victory in Elder Sign. Proving you can never have enough dice rolling, after Elder Sign they launched into what turned out to be an hour long game of King of Tokyo. Games of this length are normally unheard of with King of Tokyo, usually playing out in under half an hour. Proving his dice rolling skills were no fluke, Will won that game too. The others played Bang! with Johnny winning as the Sheriff. This was followed up by The Resistance. Proving that you can also never have enough hidden role games, they followed this with Werewolf, a game that seems mostly to be about drumming on the table with your eyes closed. After a game or two some others joined as their games finished. I don't know how many games were played in total but there certainly was a lot of drumming. When we were finally done with The Manhattan Project we played a couple of games of Coup before heading home. 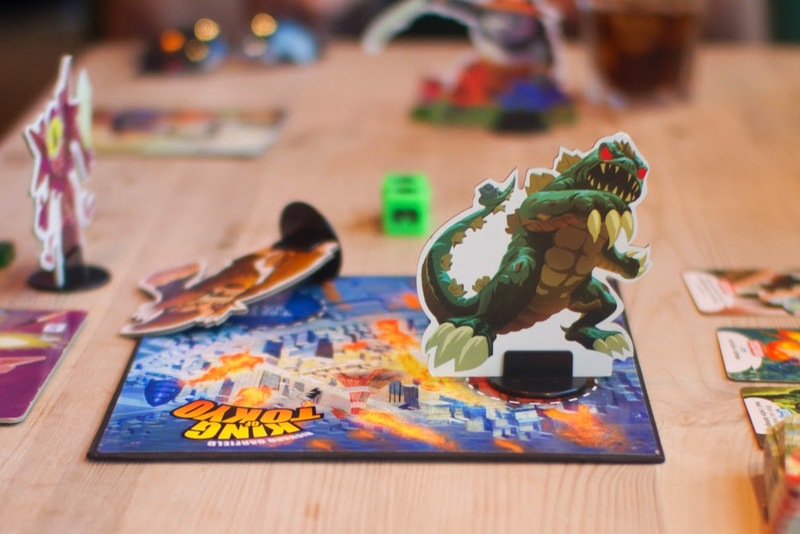 There are still plans for a King of Tokyo tournament soon, probably not next week but maybe the week after. We've just got to hope Will can't make it that week or no one else will stand a chance.